TIP! Be sure to bring your own containers to take your blueberries home after you come to u-pick. We provide containers to pick in. 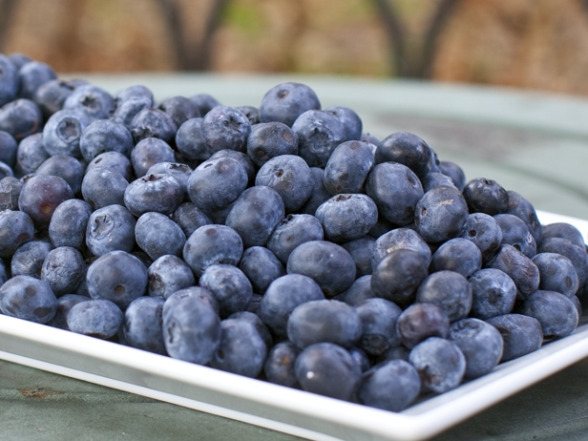 Fresh blueberries offer an array of cooking and serving options – both raw and cooked. See our video page for some great blueberry recipe ideas. Fresh berries are very fragile and should be washed briefly and carefully and then gently patted dry if they are not organic. Wash berries just prior to use to not prematurely remove the protective bloom that resides on the skin’s surface. If you know the source of either wild or organic berries try not to wash them at all. When using frozen berries in recipes that do not require cooking, thaw well and drain prior to using. Blueberries retain their maximum amount of nutrients and their maximum taste when they are enjoyed fresh and not prepared in a cooked recipe. That is because their nutrients – – including vitamins, antioxidants, and enzymes – undergo damage when exposed to temperatures (350°F/175°C and higher) used in baking. Note: Freezing blueberries has no effect at all on their high nutrient content, and the thawed berries will retain all of their fresh health and nutrition benefits. Add frozen or fresh blueberries to your breakfast shake. If the blender container is plastic, allow berries a few minutes to soften, so they will not damage the blender.